I bought a set of the updated OEM style fobs from Advanced Keys back in Sept 2015... and after trying them out for a day, switched back to the flat style fob. OEM style fobs have been collecting dust ever since. My main issue is with the flat fob I always leave it in my wallet and never have to take it out, but the OEM style fob was one extra thing to carry around. Not having to carry a fob or have an "extra" thing on a keychain was more worth it to me. The fobs are at home in a box somewhere so I can't take photos right now, but did find a photo online. Exactly the same as the 2 I received direct from Advanced Keys in Canada. They look nice and have a nice weight to them... but I took one apart to find that it's a fairly cheap plastic construction with the two metal pieces on the sides giving it all the weight. There is a tab on the back that is supposed to be able to be slide to one side allowing the bottom to come out, where you can store a spare key... but the whole thing was strangely "sealed off" and the only way to get that functionality is to dremel off some bits inside. It's almost like the keys were designed with that spare key functionality, but somebody said "screw it" and literally just screwed on the two metal sides to block it. -It took a lot longer to open the trunk by holding the dedicated trunk release on the OEM style fob, than it was to hold the Unlock button the flat fob. -It wouldn't let me program 1 OEM style and 1 flat style (you can only pair 2 fobs at a time to the system). So it's either 2 OEMs or 2 flat fobs. Good points. My wallet is already pretty thick with random cards and IDs which is why I still put the flat style on my keychain. But you have me thinking maybe I should take some non essentials out of my wallet and stick the key in there. It would be nice to have one less thing on my keychain. If you do decide to put the flat key into your wallet, consider putting the fob into a small plastic pouch (like one that small screws at Home Depot come in). My leather wallet tends to make credits cards and everything look worn after awhile and pocket lint gets everywhere. The little plastic bag-wrap helps. Another reason why I bought the OEM style fobs was to see if I could do something crazy like swap the innards into a real Camaro OEM fob... but the shape of the board inside doesn't fit the real fob. Oh well. Btw, I take back what I said before about them being strangely sealed off. Turns out the spring mechanism and latch to take out the bottom (where a spare key blade can go) is just really tough and hard to take out. Maybe if there was some more grip on the bottom piece, it'd work better. On a related note, the Advanced Keys kit comes with 2 white credit card sized bypass cards that can be used as a backup to unlock and start the car (in case the fob runs out of battery or something). Turns out these cards are generic 125Khz RFID cards. 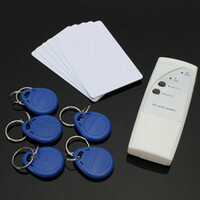 I was able to buy a cheap RFID handheld copier on eBay, a whole stack of white RFID cards, and some RFID keychain chips for less than Advanced Keys was charging for 2 bypass cards. Result: easy way to make tons of spare bypass key cards that work with your car for cheap. I never have to worry about getting locked out anymore. Ok! I've finally gotten around to switching the bypass from the Fortin to the Xpresskit and all of the quirks are gone! It seems the Fortin Evo-All was the culprit. For those wanting to do the same, here are some differences and tips for installing the Xpresskit DBALL2. 1) You'll need the Xpresskit Dball2 and the THGM610 Harness for the install. 2) Unlike the Fortin, you MUST flash the Dball2 with the correct firmware for our cars. So either buy the flasher module or buy it from a seller that will flash it for you. I flashed the GM10 v3.23 beta firmware. 3) There are two extra wires that you have to splice on the OBDII port for CAN High and CAN Low. 4) The THGM610 harness comes with a toggle switch that isn't supposed to be used but I would suggest wiring this switch in-line on the ACC wire on the harness at the ignition header so that you can flip it on when you want to use the OEM key and flip it off when you want to leave a cut key in the ignition. 5) Compared to the Evo-All, the Dball2 is lacking 12V+, Accessory, and Ground connections for the Advanced Keys Modules. In the instructions there's a connection plug labeled "T-02" that is marked to not be used. You can cut the plastic head off of it and now you have a 12V+ source (Red wire) and an ACC wire (Grey/Black wire). I grounded all the ground wires for the Advanced Keys system to a bolt by the fuse box. 6) The Red 12-pin plug from the harness that goes into the Dball2 is missing pins in pin positions 3,4, and 12 that are for the door, trunk, and hood status. I simply pulled these pin and wires from the connector that came with the dball2 and stuck them in those holes in the header on the harness. Make sure these connections are tight when you do this. Then simply wire them together and connect it to the door status input on the Advanced Keys module. 7) As mentioned before, I would suggest tapping the brake signal directly from the BCM for the Advanced Keys module instead of using the signal provided by the bypass. 8) The Dball2 has a "RAP Off" connection that can be wired into the driver door sense signal to keep the stock feel of only turning off accessories when you open the driver door after shutting the car down. I didn't connect this (couldn't find the right wire in the door motor connector, got lazy) and so my radio/accessories turn off right when I shut down the car. The THGM610 is a GM Plug & Play T-Harness for specific GM vehicles. It can be used in either standalone mode OR with a remote starter in D2D mode (ONLY). The cannot be used in W2W. How did you get around this? I know you mentioned some missing pins, but wouldn't you need many more pins, like for the tach, starter input, etc? Did you cut off the connectors of the harness on the DBALL2 side and just manually connect wires? I used the THGM610 harness. I guess technically it is wired as a standalone? Since the DBALL2 is unaware that there's another piece of equipment piggybacking its signals. The instructions for the DBALL2 have all the pin outs labeled in case you wanted to wire it up without the harness, so you simply tap into the wires that you need on the harness to send them to the advanced keys units. Tach, starter, ignition, lock, unlock, etc. included. Ah, I didn't realize that harness would have wires for lock, unlock, tach, etc, since there doesn't seem to be a need for them in stand-alone mode. As for the brake line at the BCM - I know the DBALL2 won't have a brake output when the car is off, but I assumed the brake wire at the BCM wouldn't be energized, either. Did you happen to test the DBALL2 brake output? Maybe it does work in your car? I will test on mine, since I don't really want to add a second switch to the brake pedal, or swap the power to the switch so it's always on. I'm pretty sure this is right, but it's been a while since I've done this. I think the 10 Plug on the DBALL2 might be connected using the pigtail connector that came with the bypass but I can't remember. You can easily tell what you need once you see the harness and the dball2 together. The DBALL2 and the BCM are always energized. So even when the car is off, it outputs a brake signal when you press the brake for things the like the brake lights. My problem was that when I tried using the brake signal from the fortin bypass before switching to this one, I was having intermittent problems, so I tapped it directly. Considering the other problems with the fortin bypass, it probably works on the DBALL2. But since I already tapped the BCM, I just went with it. I ended up heavily modifying the T-harness (cutting like 80% of it away), but it works great in my DBALL2 test. The only problem is the shift-lock. Even when the DBALL2 starts the truck, the shift lever is locked. How did you work around this? I didn't leave a cut key in the ignition as there is no steering lock. Hmm not sure on this one.. I have a manual so there's no lock. I wouldn't have thought that the shifter lock would be based on a key sense but maybe try putting your key in and turning to acc and using the push button to start to see if maybe you need to leave a cut key in? Thanks for the reply - I've made some progress on this. It turns out there are two locks: a mechanical lock that prevents shifting out of park without the key in the barrel, and another electric solenoid lock that prevents shifting out of park without the brake pedal being depressed. The solenoid lock acts normally when the DBALL2 starts it; it was the mechanical lock that was giving me problems. I've "half" disconnected the cable that is part of the mechanical lock and that allows me to shift out of park without the key now, but I'm trying to figure out how to remove it completely. The service manual simply says to "disconnect it". Sorry, no pics, but the white wire on the push start module is the positive start wire and should be connected to the violet wire (pin 8?) on the 10 plug going into the DB2. The BCM is under the driver dash. You'll want the black plug above the accelerator, pin 11, white wire which is the brake output. Tapping the BCM might be unnecessary though, try the output from the Dball2 first and see if it works as intended.